We are poor because you are rich. As they march across Libyia and Algeria to Morocco, their numbers grow to a quarter of a million. Meanwhile, the Commissioner does all she can to find solutions: letting a limited number of them into Europe as a steam valve, a Marshall Plan for Africa. But the walls of ‚Fortress Europe‘ are already in place in the heads of European politicians. At the same time the Afroamerican US presidential candidate „Marcus Brown“ (Joseph Mydell) tries to radicalise the marchers and stages them on TV to utilize them for his campaign. We believe that when you see us before you, you will not let us die. That is why we come to Europe. If you will not help us, there is nothing more we can do. We will die, and you will watch us die, and may God have mercy on us all. 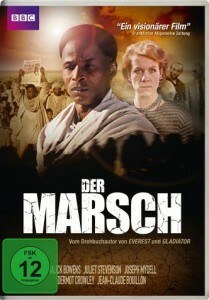 When „The March“ was first shown on German television in May 1990, it was followed by a discussion in which the movie was critized for being too pessimistic. Even though the news immediately before the sceening had reported on yet another boat with 300 African refugees arriving in Italy that day. For the link to Ghandi’s 1930 „Salt March“ to protest British colonial rule in India, for the contrast to Jean Raspail’s dystopian 1973 French novel „The Camp of the Saints“ and for an optimistic view of where Europe stands today, see the blog post va Laurence Jarvik (20.11.2015). „The March“ was directed by David Wheatley and produced by the BBC. It is available on DVD and no longer on Youtube. ARD produced a sequel of kinds to „The March“, only in reverse: “Aufbruch ins Ungewisse”. Europe has been taken over by right-wing regimes, Sweden being the last country to close its borders to its neighbours. In Germany, the last liberal newspaper has been shut down. Leftists are being persecuted by militias in the streets and threatened with imprisonment and torture by the state. The last country that grants asylum is South-Africa. The protagonist family manages a last-minute escape, but the ship sets them off at the coast of Namibia where the find themselves transposed from middle-class German household life into a refugee camp. From where the official policy would be extradition to Germany and certain imprisonment. By paying traffickers, again they manage a close escape into South-Africa, and again into a refugee camp. In Europe we tend to think of political and humanitarian asylum from the ‚donor‘ side. But then, it wasn’t so long ago that this human right also saved German lives. By extrapolating current right-wing tendencies across Europe in a rather pessimistic if not entirely unlikely way, the film makes us understand that we might easily end up on the receiving end of political asylum again. If you can’t value it as a human right and ask ‚What do I get out of it?‘, think of it like a health insurance. You pay in even if you’re healthy because you know one day you might have to rely on it. I agree it’s hard to understand why the BBC is hiding this movie which remains so highly topical. I don’t agree on the BBC being a „propoganda organisation“. I am convinced that public service media that we all mandate, pay and control are our only chance against the surge of propaganda.